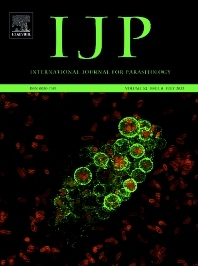 The International Journal for Parasitology publishes the results of original research in all aspects of basic and applied parasitology, including all the fields covered by its Specialist Editors, and ranging from parasites and host-parasite relationships of intrinsic biological interest to those of social and economic importance in human and veterinary medicine and agriculture. Original research includes the development of novel and innovative concepts and ideas, as well as experimental and observational science that raises new hypotheses. Because of its breadth of discipline coverage, the aims and significance of all contributions should be made clear to readers who are not expert in the particular subject of papers. In applied parasitology, it will tend to favour contributions of broader significance to the subject rather than narrow, highly specialised applications. The principal form of publication is the full length paper which contains substantial results from a major program of research. The Journal also provides a medium for the publication of shorter, but complete, papers reporting highly significant original findings, as Succinctus articles. It also publishes Thematic Issues incorporating papers on a topical theme and commissions papers with emphasis on shorter, focussed Reviews of topical issues and strategically important subjects. The Journal encourages critical comment and debate on matters of current controversy in parasitology via "Current Opinions".